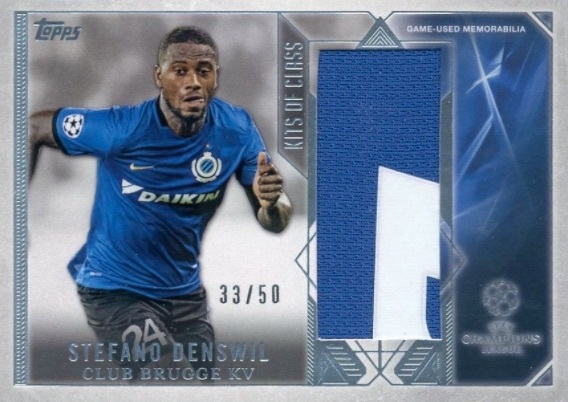 Capturing pivotal moments from the club tournament in Europe, 2016-17 Topps UEFA Champions League Showcase highlights some of the world’s most talented soccer players. Each hobby box promises two autograph cards. The base set follows the 2015 debut release featuring vivid images framed by a silver border. Several parallels add to the unique design with Gold (#'d), Red (#/25), Black (#/5), and Champions (1/1) editions. Basic inserts include Champions Pedigree, which highlights players who helped lead their team to a title. 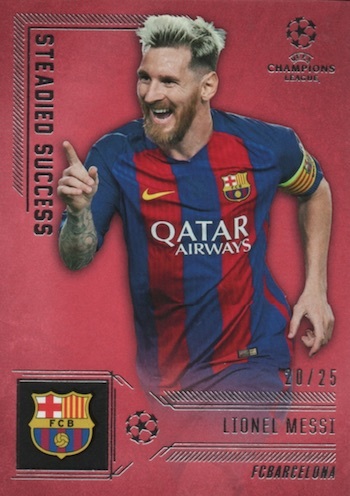 Making its debut is the Steadied Success insert that pays respect to those current players regularly vying for a UCL championship. 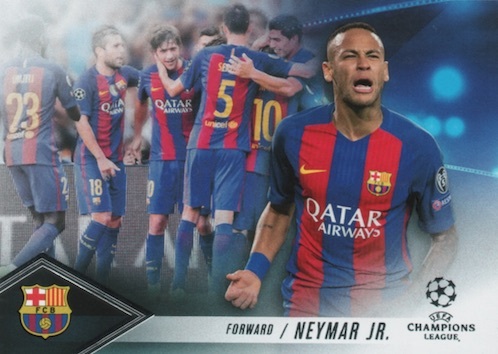 Finally, Road to Victory inserts focus solely on the 2015-16 UEFA Champions League winners, Real Madrid. All inserts add Gold (#'d), Red (#/25), and Champions (1/1) parallels. Serving as the base autograph option, the Champions League Autographs set offers signatures from renowned UCL players. The signed set maintains the base design and works with the same parallels: Gold (#'d), Red (#/25), Black (#/5), and Champions (1/1). Another autographed option is Champions Pairings, which includes two players who share a common bond. 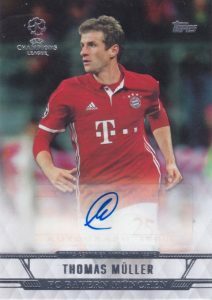 Paying homage to both active and retired legends, and, new to 2016-17 Topps UEFA Champions League Showcase, is Touch of Class Autographs. Base options for both of these signed inserts are serial numbered and include a Champions (1/1) parallel. 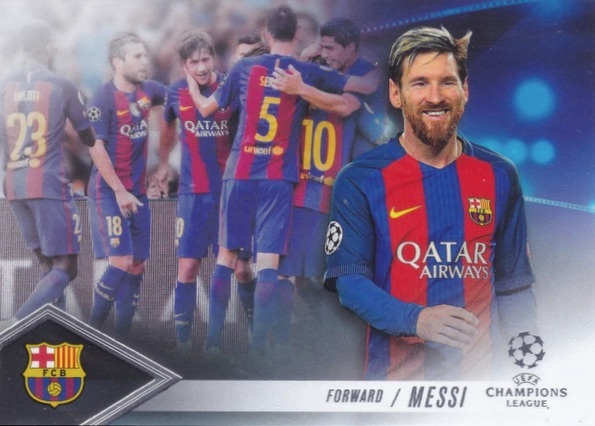 Unlike the 2015 release, 2016-17 Topps UEFA Champions League Showcase also includes memorabilia cards. Kits of Class features oversized uniform swatches from active players and provides two parallels—Black (#/5) and Champions (1/1)—that include a multi-color swatch piece. The other relic option is found with the Autograph Memorabilia cards that combine a swatch card and signature. PARALLEL CARDS: Orange (Blaster), Gold #/99, Red #/25, Black #/5, Champions 1/1. 19 Cenk Tosun - Beşiktaş J.K.
20 Oguzhan Özyakup - Beşiktaş J.K.
21 Marcelo - Beşiktaş J.K.
22 Vincent Aboubakar - Beşiktaş J.K.
23 Tolga Zengin - Beşiktaş J.K.
24 Olcay Şahan - Beşiktaş J.K. PARALLEL CARDS: Gold #/99, Red #/25, Black #/5, Champions 1/1. 13 cards. Serial numbered #/50. Shop on eBay. PARALLEL CARDS: Black #/5, Champions 1/1. 7 cards. Serial Numbered. Shop on eBay. 28 cards. 1:3 packs. Shop on eBay. PARALLEL CARDS: Gold #/50, Red #/25, Champions 1/1. CP-CT Cenk Tosun - Beşiktaş J.K.
CP-M Marcelo - Beşiktaş J.K.
6 cards. Serial numbered. Shop on eBay. 23 cards. Serial numbered #/50. Shop on eBay. Good: No redemptions, solid design, new game-used relic inserts. Bad: Autograph checklist is weaker and uneven, base signatures not numbered. The Bottom Line: The Champions League is a major annual event because it is the best clubs from Europe battling it out for one trophy. However, the 16-17 UCL Showcase product doesn’t come close to matching the excitement on the pitch. When you remove the bigger names and chop the coverage down, you are left with a product that struggles to deliver. While it does not look as modern as 2015-16, I again feel the foil-based design provides simple elegance. I also like how the parallels were decorated using a diamond shape enhanced with color. Staying fairly basic, as well, are the inserts. None are amazing but they do a good job maintaining the overall theme. 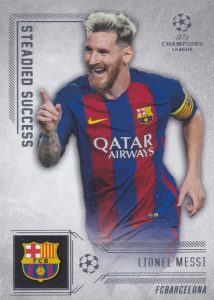 I particularly enjoyed the team celebration images on the Champions Pedigree cards and the slightly contrasting look of the Road to Victory inserts with the thick, diagonal lines in the background. Although Champions League Showcase again works with sticker signatures, they are incorporated into the design in a decent manner. 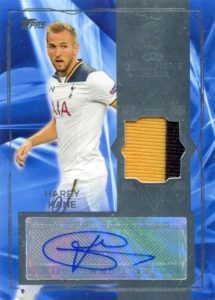 With only 13 teams featured in the primary autograph checklist, compared to the 32 clubs in the main set, the 2016-17 Topps UEFA Champions League Showcase signature list is disappointing. 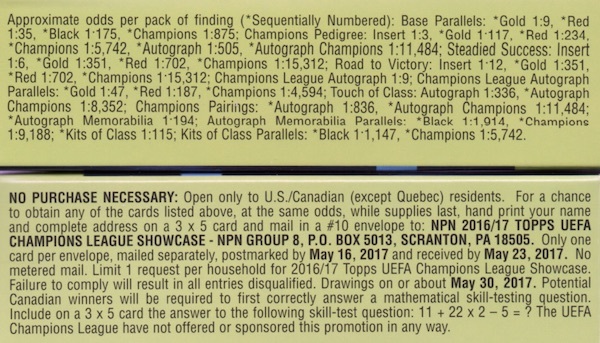 Although all live autographs with no redemptions is great, missing out on Lionel Messi and Cristiano Ronaldo, who was in all the solicitation info, is a serious negative. Of the final two 16-17 UCL teams, Real Madrid has only Gareth Bale autographs and Juventus has nothing. I don’t expect Topps to predict to the future but they should at least strive to feature multiple players from the top clubs and better overall coverage. Even with 32 signers, nearly a third comes from the same two teams (Bayer 04 Leverkusen and Borussia Dortmund). While the 2015-16 set had a larger checklist, the depth was also much better. Although several players like Harry Kane, Dele Alli, Neymar, Gareth Bale, Kelechi Iheanacho and Thomas Muller have strong value, much of the remaining hits aren’t as substantial. Because the set is very basic, most of the value rides on the two autographs per box, which runs about $80-90 at the time of this review. Unfortunately, the set is just not where it needs be when talking about a product built around the top club teams in the world. Boosting value somewhat is the introduction of the relics into Champions League Showcase. 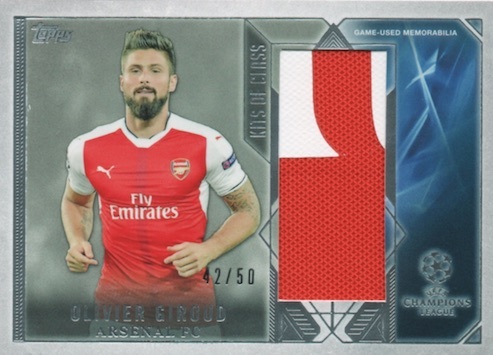 The Kits of Class inserts are even noted as game-used on the front of the card. These, along with the autographed memorabilia cards, are all serial numbered. As an extra hit in my box, the relic added value for sure, but these fall at very tough odds. Low-numbered base/insert parallels also contribute something to the value, if you come across any. On the one hand, I liked the look of the cards and pulling a relic was a nice treat. However, the checklist put a serious damper on the fun and makes it harder to be excited about the set. 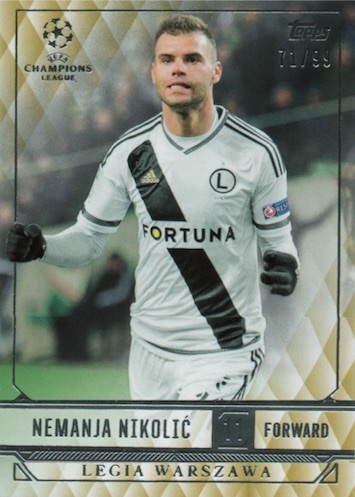 Plus, both autographs coming from the same team (Legia Warszawa) was not ideal either. Where is Ronaldo in the checklist???? Ronaldo’s in the base set and a few of the regular inserts but he apparently did not make the autograph checklist despite being featured in the sell sheet with signed cards. 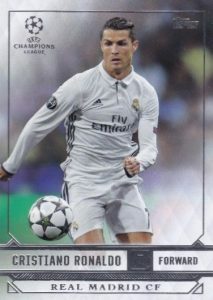 2017 18 Topps Chrome UEFA Champions League Factory Sealed HOBBY Box-AUTOGRAPH!